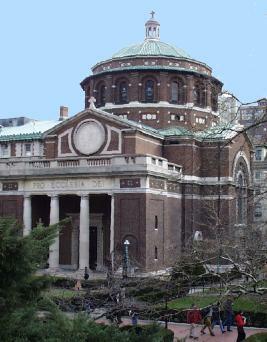 St. Paul's Chapel, Columbia University, lies on the East side of the Columbia campus, on Morningside Heights. It can be reached by subway 1 or 9, or by bus M4 or M104, alighting at 116th Street and Broadway. Enter the gates on the East side of Broadway, walk straight ahead to the middle of campus, and then half-left up the steps. The Chapel is a distinctively red-brick building with dome. It can also be reached by the M11 bus, alighting at 116th Street and Amsterdam Avenue. Enter the campus gates on the West side of Amsterdam, walk straight ahead until you reach the steps on the right-hand side, then turn right up the steps and bear half-right again. The chapel is a distinctively red-brick building with dome.